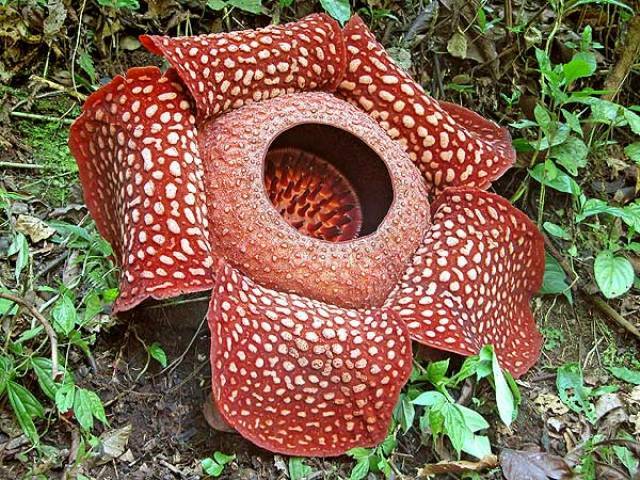 Rafflesia arnoldii is the largest flower on the earth. It can grow to be over three feet across and weigh well over twenty pounds. I'm sure images of the perfect valentine are dancing through your head, but this is one flower you don't want to give someone you care about. Mainly because it has a peculiar odor. The flies and other scavengers that pollinate this parasitic flower love it, but I doubt it would go over well on the windowsill. As unappealing as this flower is, it will still be sad if it disappears forever. You see, it only grows on a certain vine, which only grows in the primary(undisturbed) rain forests of Malaysia, Sumatra, Indonesia, and the Philippines. As the primary rain forest in these regions vanishes, so does this rare and enigmatic flower.